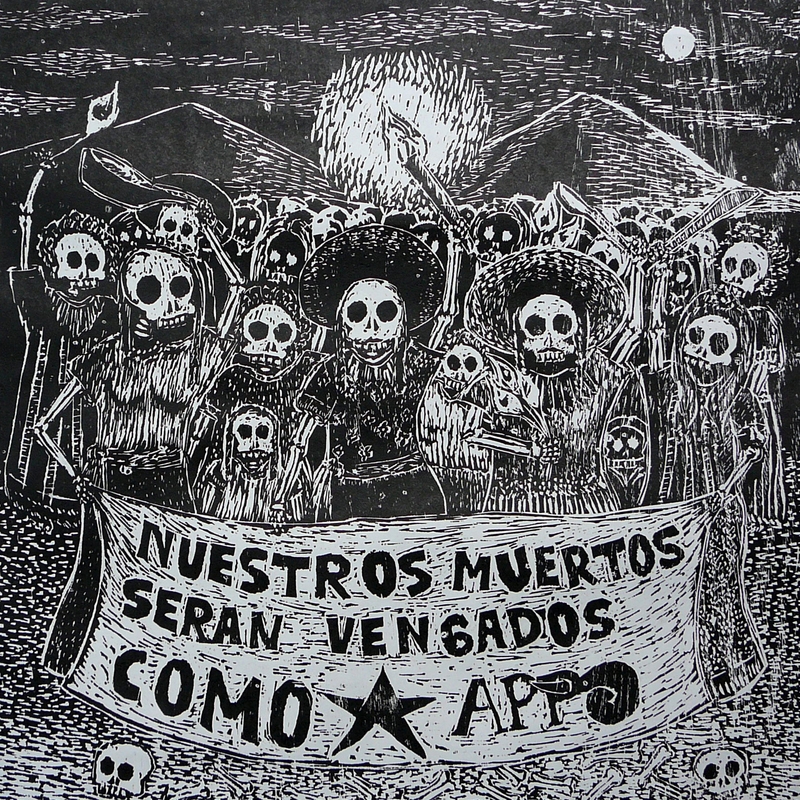 ASARO is a collective of radical young Mexican artists. I met them in 2007. 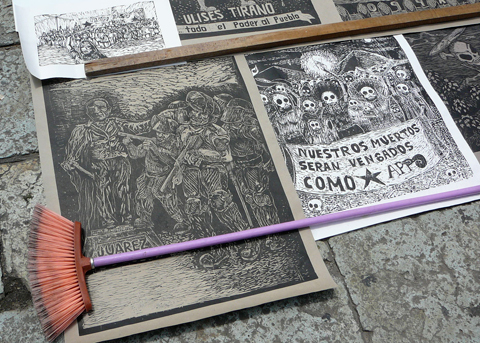 ASARO’s woodblock prints were laying in the street near Oaxaca’s cathedral. The artists were sitting on the curb. Some looked to be fifteen years old. Broom handles and chunks of stone kept the artwork from blowing away. Kneeling to look closer, I was stunned by the raw power of the images: revolutionary heroes, marching skeletons, striking farm-workers, open coffins, screaming widows. Black ink on ragged gray paper. It was as if the ink was shouting. I was mesmerized. I found ASARO’s prints astonishing, not only for their political content, but also for their artistic excellence. It was exhilarating to see a centuries-old medium, woodblock printing, applied to the revolutionary issues of the 21st century. For one hundred pesos (roughly 10 U.S. dollars) ASARO sold prints by day. At night they poured their energy into street art, or interventions, as they call them. If a fellow activist was arrested or “disappeared” ASARO commemorated the event immediately with prints and stencils. They pasted tissue paper prints on the city’s ancient walls, or used pre-cut stencils to create complex murals in a matter of minutes. 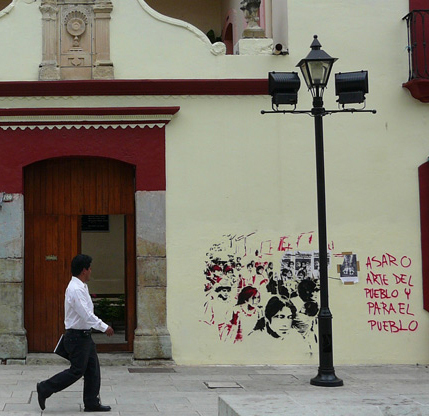 Oaxaca’s most dramatic times occurred in 2006 after the annual teachers’ strike spun out of control. Teachers and their supporters protested to oust Governor Ulises Ruiz. APPO, the self-described “people’s assembly” occupied the city for months until Mexican Federal Police brutally removed them. Amnesty International documented the killings of at least 18 demonstrators; the full report is available as a pdf. Into 2007 there were still sporadic demonstrations, arrests, and disappearances. There were other talented art collectives in Oaxaca, (notably Arte Jaguar) but ASARO’s daily gallery in the street made them the most accessible. 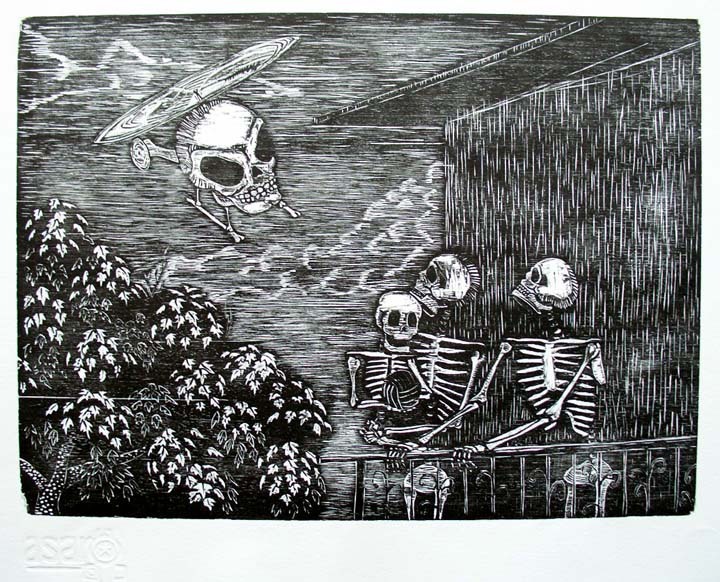 I learned that some of the crew had studied art at the university with the Japanese-born printmaker, Maestro Takeda. The trained artists taught printmaking to anyone who wanted to join. Many had led hard lives. One ASARO artist told me he was abducted by thugs and questioned for 72 hours. I believe him. In 2007, their studio’s location was secret. The police would beat graffiti artists on sight. I remember being very nervous the rainy night I carried a portfolio of 20 political prints from that studio. 'We Defend What is Ours' from ASARO's petroleum portfolio. Last month the NY Times rediscovered Oaxaca. “With the city’s street art scene, a mescal-fueled night life and one of Mexico’s most exciting regional cuisines, Oaxaca is as cosmopolitan as it is architecturally stunning.” The article points out Espacio Zapata, ASARO’s workshop at Porfirio Diaz #509. This new location is in the historic district. ASARO has also been featured in the official Oaxaca State Tourist Office’s guide to the city. Now ASARO has a blog. 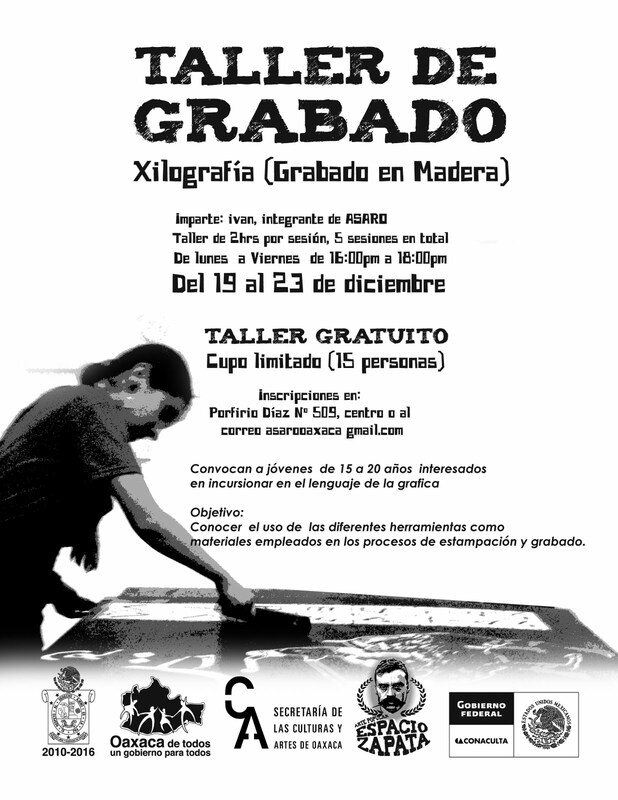 Recently ASARO offered a free course in printmaking at Espacio Zapata. One of the course’s sponsors is Conaculta, Mexico’s National Council for Art and Culture. 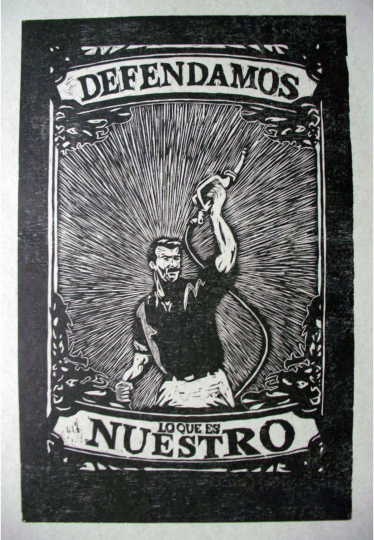 Espacio Zapata poster for free course in woodblock printing, 2011. There is another change. A new governor, Governor Gabino Cue, replaced the polarizing figure of Ulises Ruiz. The New York Times is right; this is a good time to visit Oaxaca. Princeton University is exhibiting a portion of their splendid ASARO print collection. Alas, none of the artists will be able to attend the Feb. 9 reception, but I will be there. The public is invited. I am honored that Princeton asked me to write about ASARO for the gallery walls. I’m taking part in a panel discussion “Born in the Zocalo: Art and Protest in Oaxaca, Mexico” at 4:30 on 2/9/2012. Reception to follow. Would you please tell the people why is that any of the ASARO artist will be present in the exhibit, i think is important to the public to know. Valentin, Thank you for bringing up this point. No ASARO artists will be there. It is very expensive for Mexican citizens to get Visas to the US, unlike going to the Mexico for US citizens. I do not think Princeton invited any ASARO artists; they were not in contact with the group. I do know that in 2008 UCLA’s Fowler Museum invited 2 specific ASARO artists to an exhibition and they were denied visas after they traveled to Mexico City for interviews at the U.S Embassy. I know some might think the reasons for denial are because of political views. Here is what I presume. Most, not all, of the members of ASARO are unmarried, underemployed, and under 25. This demographic is considered a very high risk for overstaying a visa. I know that ASARO artists have visited Europe and Japan, places that welcome Mexican visitors. We managed recently to get one artist from the group to Kutztown. The visas and permits were over $300. Since 9/11, Mexicans, among others, have had to pay a fee called Sevis to visit on a cultural exchange. For Mexicans this is a non-refundable $180. We did have success with Cesar Chavez’s recent visit to my campus, http://wp.me/pYdFG-Jc Hopefully, there will be more exchanges of this sort in the future. This dialog between Mexico and the U.S is important. Thanks for replying. It is true that travel from Mexico to anywhere else is very expensive. But I thing that the issue for most of latin-american people is almost impossible to get a visa to come to the U.S. because their immigration policies. It is sad than their work will be exhibit in other country and in a prestigious University like Princeton and they won’t have the chance to explain anything about their work. Congratulations to the members of the ASARO, please keep making great art! What a pity that fear rules so strenuously that people aged under 25 and underemployed are considered a threat. This is the measure of a “great” empire.